Workshops are special two-hour learning sessions which are usually on a Saturday afternoon. These interactive extended sessions allow students to learn more than ‘how’ but also ‘why’ we do certain things in yoga. Even better, they include a glass of granny’s homemade lemonade specially brewed for the session. Please note there is a 7-day cancellation policy for workshops. Your spot is not confirmed until payment is made. The Chinese believe in the idea of longevity and it is based on being in harmony with the universe (天人合一). This is an ancient Chinese idea known as “Dao”. Dao means “the way” or “being on the path”. It is a state of perfect balance that requires no alteration. The whole universe manages itself by being in this state. In the ancient Chinese medical text, ‘The Yellow Emperor Inner Classics’, it states “…men who knows the Dao, follows the principle of Yin-Yang, harmonise with numerology, eats according to season, lives within a health routine, do not exert themselves unnecessarily, so that the body and mind can remain integrated”. Qi or Prana (in Indian yoga), is the key in all human movement. This workshop begins with meridian opening sequences and a short standing sequence to ground the energy. When the body begins to ground the Qi, it will have more freedom in its flow and expansion. The practice targets all the Yang channels in the body. * Organic lunch will be provided on both days. Please email [email protected] or call 9781 3403 to book. เวลา: 9.00 - 14.00 น. *** This is a mandatory course for applicants for the Yin Yoga Teacher Course in the year 2020. Time: 9.00 - 14.00 hrs. Each day practice consists of discussions about the practice concept. Adjusting the asana and the training set that helps to see the progress in the body every day. This is an important workshop for anyone who would like to know more about the meridian and how to get deep fascia release before cultivating the meridian work. Meridians are found along the fascia sheets and fascia tension will cause stagnation of Qi in the body. According to Chinese Medicine Meridian Theory and Ayuverda Marmar System, both claims specific energetic pathways that need to be unblocked in order for the Qi to flow to the tail end (or extremities of the body). In this workshop, we will explore all the major positions that will help to unblock the main Qi junction and promote good blood flow. Space is very limited. Register Early. Note: You need to have completed the full course at least once to qualify for meridian teacher training. Meridian Practice is uniquely developed by Victor from his understanding from Traditional Hatha Yoga, Chinese Meridian Theory, Ayurveda Marmar System to promote the dynamic of Qi flow. This is a more refined practice which requires the feel of Qi flow in the body. The three Yin pillars are Grounding, Holding and Relaxation. It is the last pillar which is most difficult when the body moves. Qi works through the fascia system in the body and the temperature also changes from hot at the top to cold below. This is known as Yang Qi and Yin Qi. As the Yang arise it is mix with the blood to move the Qi with the blood back down to complete a whole new flush of fresh Qi into the whole system. As it moves down, it turns cold when it moves further and further away from its centre. The cold becomes Yin Qi which consolidates and bring waste to its proper places waiting to be expelled. If this is kept in balance, then everything will work well. However, when Yang is weak to move the blood and continues to stay at the hot, while the cold accumulates below. The body becomes a breeding ground for diseases. In this workshop, we will discuss on how to prevent diseases, self-healing, rejuvenation and anti-aging. YIN YOGA in Asia Yin Yoga Master Advanced class of Yin Yoga for those who speak Japanese and Japanese under the guidance of Victor Chan. This course is for students who have already taken TT, participated in Victor Yoga or Yui Kawabata's Yin Yoga Retreat and courses, and have already experienced Yin Yoga that has evolved. Application acceptance: We accept by mail from January 1, 2019. * Please note that we do not accept applications via SNS or inquiries. Please register by e-mail to [email protected]gmail.com. Confirmation of transfer of participation fee will be considered as reservation completion. 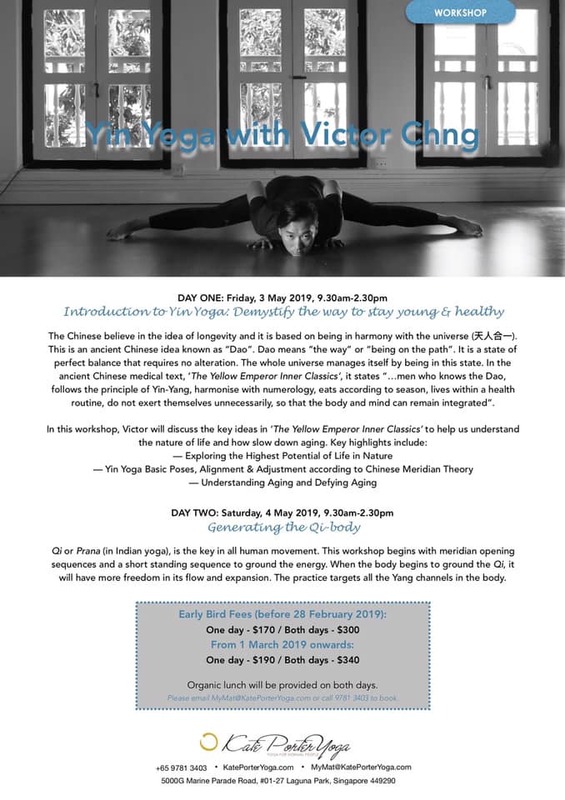 This is an annual event to provide continuous training to Yin Yoga Teachers who had been certified by Victor Chng.